Non enveloped, icosahedral virion with a double capsid structure, about 70 nm in diameter. 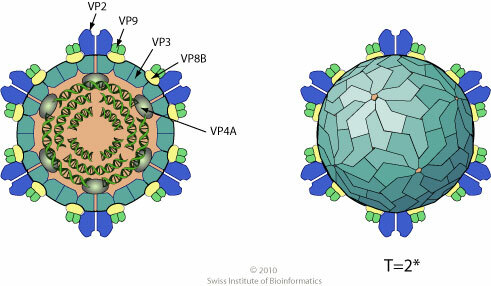 Pentameric turrets (VP2) sit on the outside of the innermost capsid (VP3). Each turret is surrounded by five peripheral trimers (VP9) and each trimer binds to three clamp proteins (VP4B). The outer incomplete capsid has a T=13 icosahedral symmetry, the inner capsid a T=2* icosahedral symmetry . Segmented linear dsRNA genome. Contains 10 segments coding for 12 proteins. Segments size range from 1162 to 3849 bp. Genome total size is about 26 kb (RRSV). NATURAL HOSTS Plants (graminae, mainly Oryza sativa), planthoppers (vector). TROPISM Plant: Phloem or phloem-associated cells. ASSOCIATED DISEASES RRSV: stunting, enations on veins of leaves and leaf sheaths, ragged leaves, flower suppression. Rice ragged stunt virus (RRSV) Pns6 protein suppresses host cell RNA silencing .